Hello! This morning I woke up at 5:30am ready to start the day. I’m digging my early wake ups since the time change I’m a morning person. 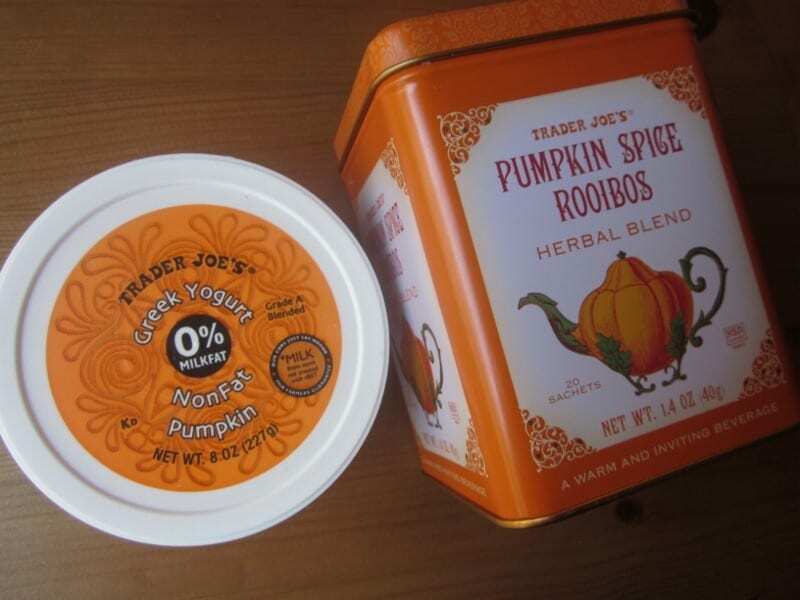 Just the Tip Tuesday: Here are two Trader Joe’s products you can skip – and shockingly they are pumpkin! Blasphemy!! 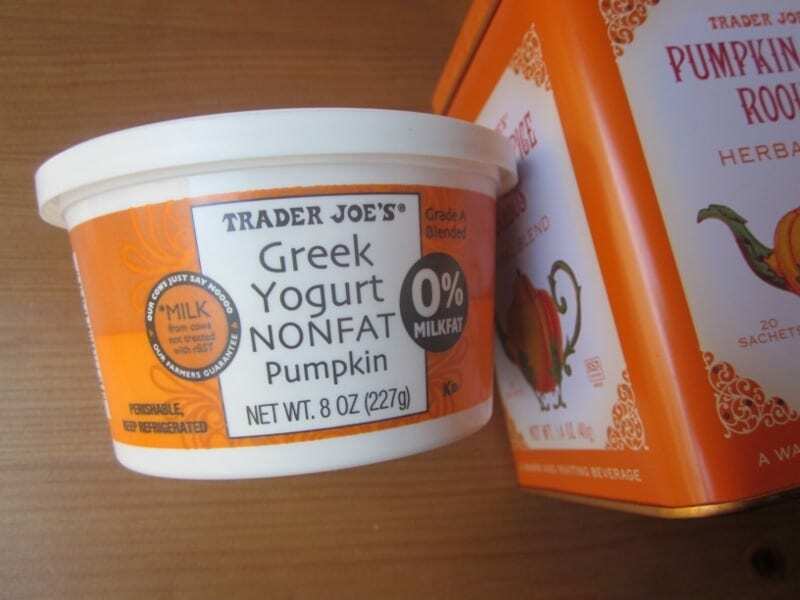 I tried the Trader Joe’s Pumpkin Greek Yogurt this weekend with Ben. He is a fan, I am not. It’s a little too tart and there are not enough spices in it for my taste. Sure, I can add more but why don’t I just make my own then? Also, I’m not impressed with the Pumpkin Spice Rooibos tea. Side note: My third Halloween costume idea was to be McKayla Maroney not impressed and just cross my arms and make that face all day. Is that how you talk to yourself too? Anyway, I got to the gym before 6am and made up this strength session before I was awake. 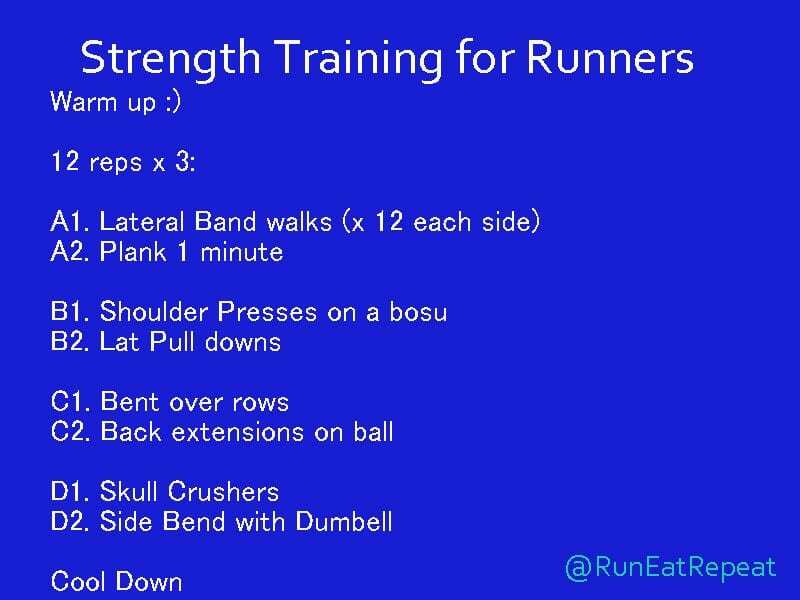 My main goal was to work the areas that I need to help me run, but don’t get worked while I run – follow? Question: Any products you’ve tried lately that we should skip? I find it’s much easier to stir canned pumpkin into my regular Greek yogurt and add my own spices. Delicious! 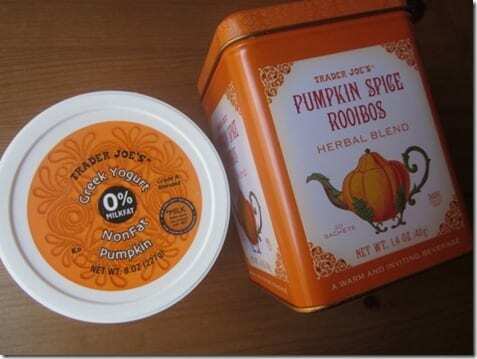 I was going to buy the TJs pumpkin tea today. Now I won’t. Question: What did you not like about it? I freakin’ l o v e Celestial Seasonings Thai Coconut Chai whatever. Yummers! And the Bengal Spice is always a winner for me. I feel like it was kinda weak and not pumpkin-y or spice-y enough? That’s why I love that Bengal Spice. Spicy!! You talk so much about your running on your blog that I was under the impression that you only do that and no other alternative training. Interesting to see your strength training here. OMG! I said the same thing to myself this morning! 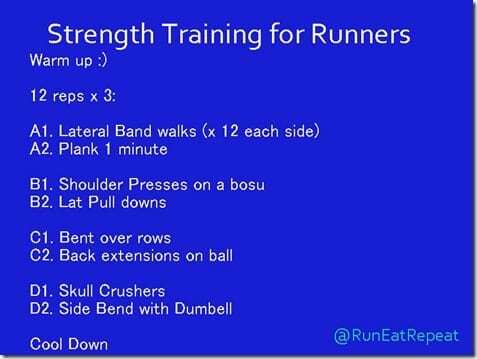 I mean strength train and injured. So it was a back/lats and bicep workout. Am glad I did it. I can’t think of any recent disappointments, but I can rave about Teavana’s Precious White Peach tea which is amazing- especially iced! I drank a gallon over the weekend of that stuff. Yes I have to talk sternly to myself a lot!! Thanks for the heads up on the pumpkin products…I can’t believe it but I will take your word for it!!! You had me until “Skull Crushers.” What are those? Thanks for the info on the tea. I put it on my christmas list. My daughter has a TJ and I don’t. I can’t think of any products that I’ve tried recently but your Halloween idea reminded me of a sign I saw at one of my recent half marathons (maybe in Michigan or Iowa). Anyway, they had a huge picture of her and next to it was written, “Keep running. MaKayla is not impressed.” It made me chuckle…and of course I kept running! I recently bought the Better’n Peanut Butter and I hated it. It was horrible. I’ll stick to real peanut butter…too bad I had to learn the hard way. I learned that lesson the hard way a few years ago. Boo. I bought the Jello “Pumpkin style” pie (WTF?!?). It shall be known as Vague Pie from here on out…..freaking weird. It tasted vaguely like pumpkin pie spices and nothing. Also, I tried the Krusteaz Gingerbread Cake mix…..it didn’t even make my kitchen smell good while baking! Then it just tasted like a very mild gingerbread. Nope. Not worth the calories. A couple of years ago a friend of mine gave me her mom’s recipe for the best gingerbread I have EVER tasted. I’m itching to make it this year! Wow, that pumpkin yogurt looks good. Does it taste as delicious as it looks? Nah, I wasn’t a fan. Sadly, can’t think of anything to skip, but I found some new hummus called Grandma’s, and I pretty much want to take a bath in it, it’s so amazing! Girl, my IT band has been killing me lately and I’m working up to my half not recovering. I’ve been walking more and trying to add in the strength training I know I need to do–but for both I’d rather just run and be done. ugghhh. I bought those new (maybe new-to-me) starbucks via packets that you pour into your water….barf. I bought the cool lime flavor and even mixed it with way more water than you needed and it was so strong and the flavor was just nasty. I do not recommend. I love your inner monologue. When I talk sternly to myself I use my full name Katherine. Means biznass is going down. lol! But if you see the gingerbread house flavor, stock up!! It’s seriously tasty! Nice great workout plan. I want to try the lateral band walks at the gym and feel normal. but…. i never feel normal, so i would try it anyway.